Guadalupe Garcia de Rayos waits at the KBI comedor after being deported. Photo by Kendal Blunt/Nogales International. When Guadalupe Garcia de Rayos reported to immigration officers on Wednesday, February 8, instead of the routine check-in, she was arrested, detained, and deported. In one of the first deportations which revealed the shift from the practices of the Obama administration to those of Trump’s, Guadalupe Garcia de Rayos was taken into custody in Phoenix when reporting for her regular check-in with immigration authorities, something she’d been doing without incident since 2013. Within 24 hours, she was deported to Nogales. Amidst the current uncertainty for undocumented immigrants, Guadalupe, 36, was more anxious about reporting for this appointment, and the staff of Puente, an immigrant advocacy group, advised that skipping the appointment or seeking refuge at a sanctuary church were also options. Part of her fear was due to a 2008 arrest—during one of the-Sheriff Joe Arpaio’s workplace raids, currently challenged as unconstitutional—for using a false Social Security number to obtain work to support her family. She pled guilty to the felony charges, served six months, and appealed her deportation order to stay in the U.S. with her children, both U.S. citizens. The six-month check-ins have been part of Immigration and Customs Enforcement supervision since then. That morning, Guadalupe went to Mass with her family before reporting to ICE with Puente volunteers and others for support. Her arrest spurred a demonstration 200 strong, attempting to stop the van carrying Guadalupe and other immigrants. Still, she was taken to the border the following morning and released in Nogales, leaving her husband, also undocumented, and her teenage children behind. 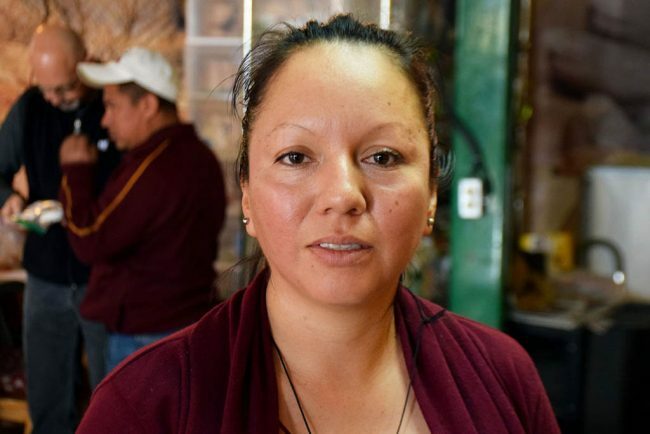 With the other immigrants, Guadalupe found her way to the KBI, where she stayed at the shelter for one night before moving to a hotel, sponsored by Puente, to visit for several days with her kids, sister, and brother-in-law. Puente and the KBI organized a press conference in response to the media attention, and now Guadalupe has returned to her native Guanajuato where she continues to keep in touch with her family in the U.S. and confer with Puente and her lawyer about next steps. Guadalupe’s story illustrates the precarious situation mixed status families find themselves in as deportation policies become more stringent and harsh. During the Obama administration, Guadalupe was not a priority for deportation—she’d served her time for a minor offense, has had no record since, and contributes to her community as a mother, neighbor and employee. But the new orders (and the Homeland Security memos issued after Guadalupe’s deportation) have created an environment of fear among the undocumented and zero-tolerance among enforcers. She poses no security risk, has U.S.-born children, and cooperated with immigration officials over years of check-ins, and yet her family is now separated and their future, unclear. in the same boat. I will give support to your organization and help you make a better world. I can only hope that all nations on this continent someday can pass freely to and from the tip of Terra del Fuego to above the Hudson Bay in peace.